The Arlo Smart Home Security Camera System is a follow on generation to the VueZone. These cameras are made by a large networking company called Netgear which is known for their line of wireless routers. They now have a division called Arlo which puts out security cameras. I have used their products for a long time, both the cameras and routers. They are reliable and easy to use. You don’t need to be a network genius to use their products. Netgear got into this line a few years back when they purchased a company called Avaak. They have carried the basic premise of these cameras forward to the Arlo Smart Home Security Camera System. The cameras are somewhat unique in being battery powered. There are pluses and minuses to that design which we will cover in this article. You can access the Arlo Smart Home Security Camera System with your smartphone or via their web portal. The IOS and Android apps are fairly typical for security camera applications. You can view all the cameras in one view. It provides displays for signal strength, battery power remaining. You can perform most of the basic settings from here. There is a motion detection function and you can establish a schedule based upon time of day. Motion is detected with the use of Infrared technology (body heat). The software allows establishment of a sensitivity setting of 1 – 100% for sensitivity. Putting it in the middle is typically the best advice but something you need to play with. There isn’t any on-board storage but unlike many competitors, they provide 7 days worth of cloud storage at no charge. Compared with some other manufacturers like Nest, this is a huge benefit. Arlo also offers paid upgrades which increase the number of storage days all the way up to 60. Connectivity refers to the connection of the cameras to the base unit since the base is wired into your home router. The cameras connect to the base unit at 2.4GHz using 802.11n. Given the 300 foot connectivity distance stated by the manufacturer, only 2.4GHz is feasible as 5GHz begins to deteriorate at much shorter distances. First thing to be aware of is that the Arlo Smart Cam isn’t a traditional standalone webcam. Each camera is a slave to a master router. The master router is wired into your home’s router. 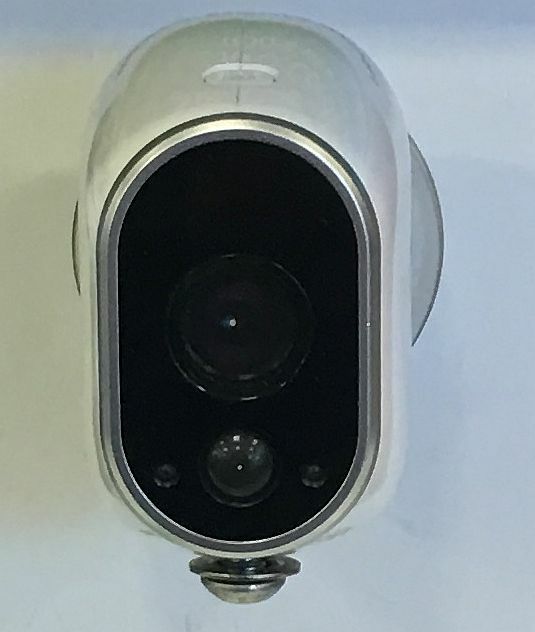 The manufacturer claims the cameras can be 300 feet away from the base station but I think that’s a perfect case scenario and realistically speaking, it will be less. A lot of variables are going to determine the workable distance including the number of walls that are in the way and the selected camera resolution. You will sync the cameras to the base station before use and you will do that before putting them into position as this process requires the camera to be within a few feet of the base. Just press a button on the camera and one on the base and they hook up. This camera has some very nice features. Most obvious is that it’s powered by inexpensive lithium CR123 batteries. This means you can place it anywhere and not have to be worried with plugging it into a wall outlet. Battery life is claimed to be 4-6 months, but it’s again depending upon use. If the camera is only used on an infrequent basis, you will get a lot of battery life. If you check it out more frequently and use the highest resolution, the battery life will be a fraction of the stated maximum. Fortunately the software provides a battery life indicator. That’s all well and good if you are around to change the batteries. If you are using this to monitor a vacation home, some careful planning is suggested (I learned that the hard way). Forget about sound. There’s no microphone. This might be a deal breaker for some. It depends upon the intended use. If just using these as a security camera, this might not be that important. If using it as a baby monitor, this might not be for you but you can consider the Arlo Q camera line which includes a microphone. The image is very clear. The 720p lens gives a nice clear picture day and night. There are 850 nm LEDs which illuminate up to 25 feet for night use. The cameras are light and small. They measure 2.8 x 1.7 x 2.6 in and weigh a little more than 4 ounces. The Arlo Smart Home Security Camera uses a dome shaped magnetic mount with an adhesive backing. At least that’s what is included in the box. There is also a standard 1/4″ – 20 threaded tripod hole on the bottom of the camera that can be used to mount to alternative mounts. This means a variety of universal camera mounts can also be used on the these cameras. These cameras are waterproof. Put them outside to monitor your environment. Remember these come with a temporary magnetic mount so hide them well. The Arlo Smart Home Security Camera System is a fun camera to use and easy to install. If you are looking for fast and simple to access security system, and voice isn’t important, this is one to consider.